The properties of pure gold have led to explorations in creating gold alloys and strengthening gold for many uses. 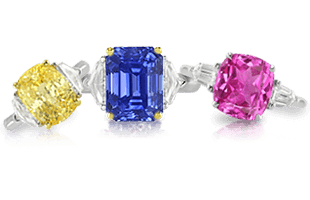 Customers in Asian countries are more inclined to buy pure gold jewelry than Westerners. 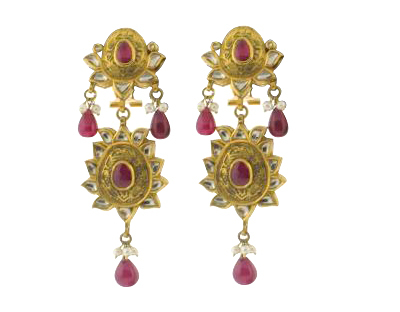 These traditional Indian earrings are made of fine gold and set with rubies, diamonds, and pearls. Pure gold is referred to as fine gold. Fine gold is not typically used in jewelry because it is very soft and can easily scratch. 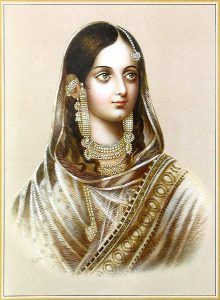 The market for pure gold jewelry is small; consumers usually consider pure gold pieces to be more of an investment rather than items to be worn. Drawing of Zeenat Mahal, wife of Bahadur Shah II, wearing traditional Mughal jewelry. Gold jewelry is usually alloyed with metals such as silver, copper, zinc, and nickel to reduce its cost and to change its characteristics. Gold alloys increase the hardness of the metal, which improves wear and permits a higher polish and brighter luster. Gold alloys also have a vivid range of color. Alloying gold with copper produces a red or pink color; silver produces a greenish color; iron a blue color; bismuth a black color; aluminum a purple color; and nickel or palladium a white color. Gold is often alloyed with copper and zinc. Many of the white gold alloys were developed after World War II as substitutes for platinum. 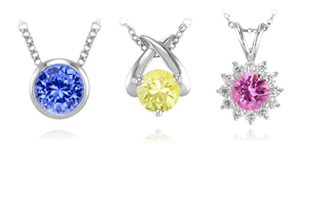 Consumers had developed a preference for platinum’s white sheen in their jewelry. At the time, however, platinum was considered a strategic metal, essential to the war effort and jewelry manufacturers were forbidden from using it. 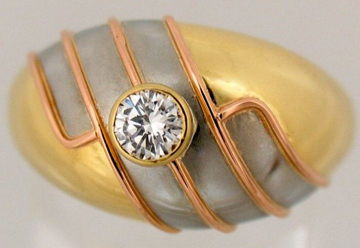 A unique ring made of 18K pink, white, and yellow gold. Gold alloys usually weigh less than pure gold and they are also less expensive, making fine jewelry more affordable. Some people are sensitive to the metals used to alloy gold, but this allergic reaction can often be avoided or even entirely eliminated. 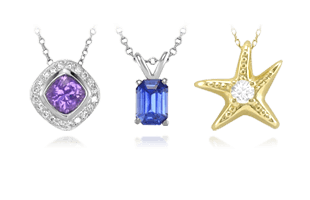 Comparisons of 10K, 14K, 18K, and 24K yellow gold. The gold content of an alloy is described in two ways: fineness and karatage . Fineness is a measure of purity expressed in parts per thousand. Pure gold is said to be 999 parts fine. Gold with a fineness of 750 has 750 parts (75%) gold and 250 parts of other metals. A black gold and diamond wedding band. 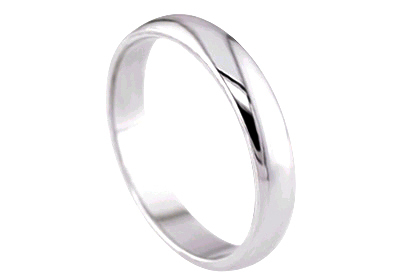 A 14K polished white gold wedding band. The relationship of these two types of measures is summarized below. * In the U.S., 14K is defined as 583 fineness. 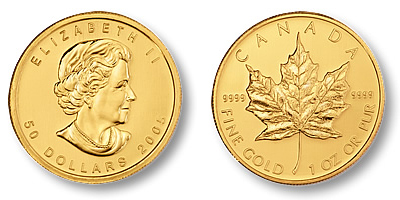 This Canadian Maple Leaf gold coin is 999 parts fine. 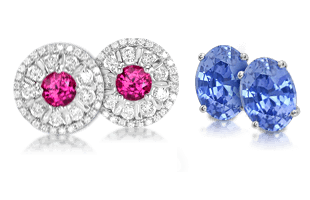 It is possible for jewelers and appraisers to perform simple tests to determine the fineness of your jewelry. Next, we’ll discover all about Platinum Alloys and Fineness | Facts and Figures.